A witness, Mr Arifayo Falodun, yesterday informed an Ikeja Special Offences Court how Emmanuel Nwude, a con man convicted of defrauding a Brazilian bank of $242million forged legal documents of property forfeited in judgment. Nwude was convicted by an Ikeja High Court in 2005 for impersonating Paul Ogwuma, a governor of the Central Bank of Nigeria (CBN), who had served from Oct. 1, 1993 to May 29, 1999 in order to defraud a Brazilian bank. The bank, Banco Noroeste, was defrauded of $242million between 1995 and 1998. As at the time of the incident, it was the third largest bank fraud in history, resulting in the collapse of Banco Noroeste in 2001. Nwude was sentenced to 25 years imprisonment for the fraud in 2005 by Justice Joseph Oyewole. His conviction was the first major conviction for the then newly established Economic and Financial Crimes Commission (EFCC). Nwude after serving part of his jail term is, however, back in court alongside two lawyers- Emmanuel Ilechukwu and Roland Kalu–over a 15-count charge of forging the documents of the property Justice Oyewole had ordered Nwude to forfeit to his victims. At the earlier proceedings, Falodun a legal practitioner in the law firm of Sofunde, Osakwe and Belgore, led in evidence by Mr Nnaemeka Omewa, the prosecuting counsel for the EFCC gave a narrative of how the property fraud was perpetuated by the defendants. “Pursuant to the said invitation we wrote a letter dated Oct. 9, 2017 to the EFCC where we explained the role of our firm concerning the property. “Our clients who are the majority shareholders in a Brazilian bank named Banco Noroeste had made a complaint to the EFCC regarding the fraud perpetuated by certain persons including the first defendant. “The fraud was in excess of $190million and upon the complaint, the first defendant amongst others were charged before the High Court of Lagos with charge number -ID/92C/2004. 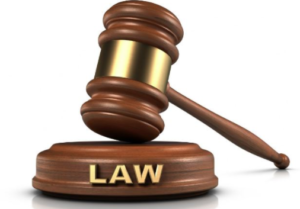 “Sentence three of the judgment specifically ordered that shares and other undertakings of the first defendant and Emorus Autos Nigeria Ltd be forfeited to victims of the offence. “The relevant part of the schedule is the 26th item which is annexed to the amended information dated Nov. 18, 2005 upon which the defendant was convicted and sentenced,” he said. The witness said that pursuant to the judgment, his clients who were the victims of Nwude’s crimes sold the property located at Plot 38b Mobolaji Johnson, Oregun, Lagos which initially belonged to Emorus Autos Nigeria Ltd to Rossab International Ltd.
“Before the deed was registered to Rossab International Ltd, our clients had registered the deed and and the judgment at the Land Registry. “The Court of Appeal found that the respondents as victims of the offence in which the appellant (Nwude) was the perpetuator. “Till now, we are unaware of any appeal of the Court of Appeal’s judgment,” Falodun said. Omeha, the EFCC counsel, requested for an adjournment due to the unavailability of some documents which were to be tendered in evidence by the prosecution. Justice Mojisola Dada adjourned the case until April 18 for continuation of trial. The post Witness tells court how Emmanuel Nwude, defrauded a Brazilian bank appeared first on Vanguard News.